The encounter broke out in south Kashmir’s Tral belt, known to be a hotbed of terrorists. New Delhi: Three terrorists are believed to have been killed and at least one soldier injured Thursday morning, in the first encounter of 2019 in Jammu and Kashmir’s Tral, a hotbed of terrorists. Sources in the security establishment said that the encounter is on in Gulshan Pora village in the Tral belt of south Kashmir’s Pulwama district. 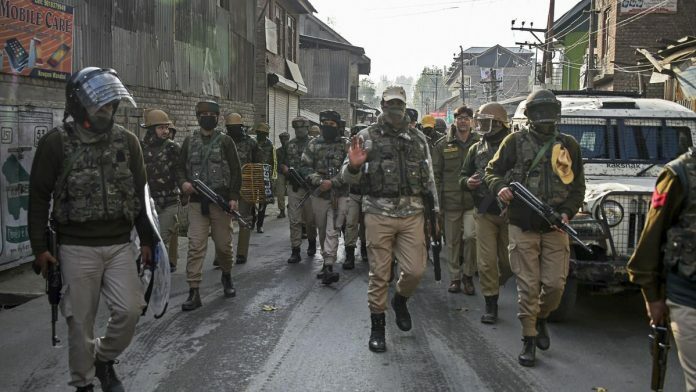 Troops from the 42 Rashtriya Rifles, along with personnel from the 180 Battalion of the CRPF and the Special operations Group of the Jammu and Kashmir police, were carrying out a cordon-and-search Operation (CASO) in the morning. “The terrorists opened fire at the soldiers which led to an encounter,” a source told ThePrint. He added that at least three terrorists are believed to have been killed, but their bodies have not been recovered. The combing operation was on at the time of filing of this report. Locals reportedly took to pelting stones at security personnel to try and disrupt the operation, sources said. While the Army, along with the special operations group, is engaged in the inner cordon, personnel from the CRPF and the regular police are providing the second and third cordon to ensure locals do not disrupt the operation. Following the deaths of civilians in Pulwama on 15 December, the administration strictly asked security forces to follow the Standard Operating Procedure and ensure zero collateral damage. This is the first encounter of 2019. The Valley witnessed an increase in the number of encounters last year, with security forces killing 248 terrorists and nabbing 58 others. Sources said special efforts are being made under Operation Rakshak to ensure that terror leadership is rooted out.